Designing and creating artefacts for a speculative future based on current societal trends and phenomena allow us to critique on how, when the trend and societal behaviors develop to an extreme, our livelihood and society would be like, and what potential side effects and societal problems would arise. 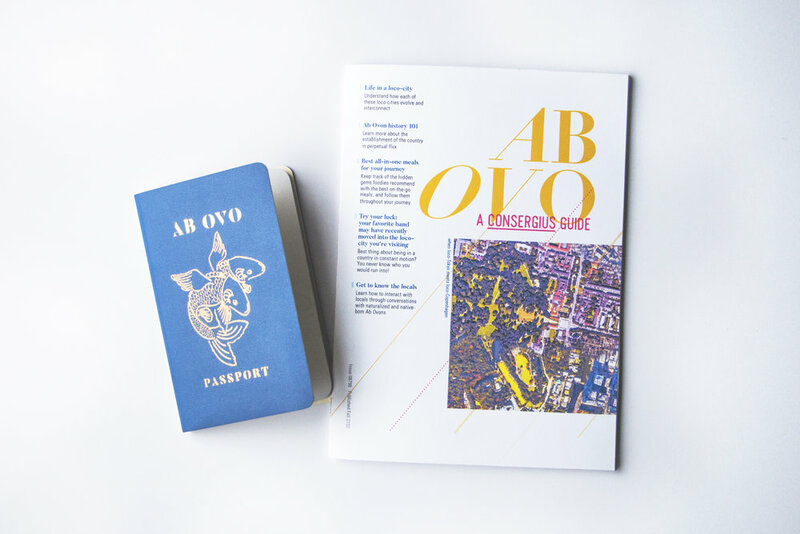 Travel guide for tourists who want to visit Ab Ovo. I notice that a lot of things in this current age are made to be mobile, from the most obvious example of having wheels attached to tables and other furniture, to having homes designed to be reconfigurable and having retail and educational experiences to be “on the spot”, such as pop-up shops and exhibits. There is a trend that things seem to be considered more valuable if it has more flexibility or adaptability, or has multiple uses. This sheds light on the fact that people in this age are constantly on the go and are accustomed to multi-tasking. People are grown to relate to their environment with less permanence, and lifestyles with frequent changes to environments are quite common. This emerging phenomenon also reflects an underlying desire for more return with least effort, which flexible modular environments afford. In today’s society, travelling is considered a luxury and a sign of wealth in both financial and cultural capital. If one moves around a lot (whether for vacation or work), most likely one is considered more well off. To be able to afford to own things or create environments that are often temporary (where its “essence”/purpose is more valued than the thing/environment itself) implies that one has the excess resources to recreate the thing/environment in the future as one moves. 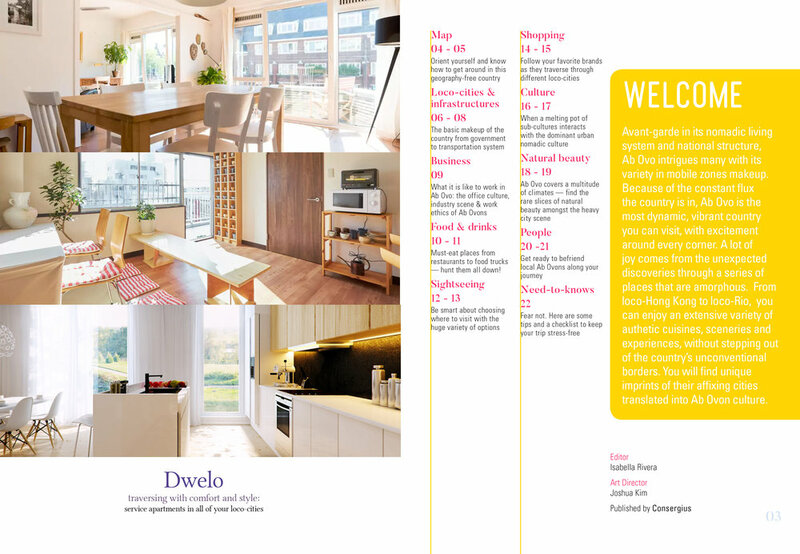 Travelling, flexible workspaces and multi-cultural work exposure is generally considered a desired lifestyle. It's increasingly common for people to have lived in different cities at different times of their lives, giving birth to more third culture kids. 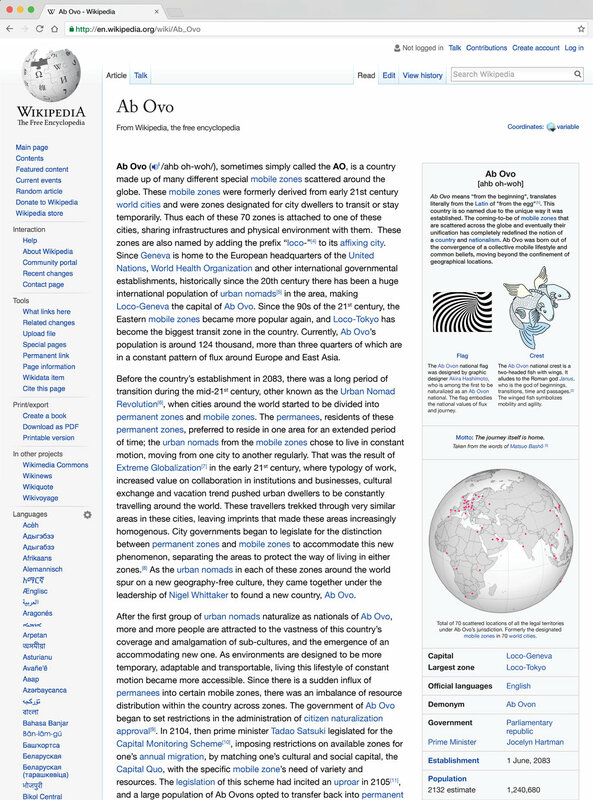 In the future, extreme globalization gives birth to a new nation without geographical borders: Ab Ovo — where residents constantly move across designated zones around the world. In this increasingly globalized age, cities around the world are becoming more similar, and culture breaks free from geographical specificity. In a speculative future where place is defined by the mobility of its inhabitants, every city is divided into “permanent zones” and “mobile zones”. While the “permanees” stay rooted in their homes, the “urban nomads” stay temporarily, bringing their mobile environments with them as they move to other mobile zones across the globe. As the urban nomads of each city converge, their collective identity give rise to a new nation, Ab Ovo. I designed and hand-bound an Ab Ovon passport, on which the national emblem is spray painted in gold. Double-headed winged fish alludes to the Roman God Janus, who is the god of beginnings, transition, time and passages. The winged fish symbolizes mobility and agility. This girl was born not within the boundaries of Ab Ovo, but in Denmark, but was naturalized as a citizen at the age of 21. Certification of her citizenship naturalization approval. There is a system governing the nationals’ migration patterns. Nationals are to move city zones within Ab Ovo every so often. 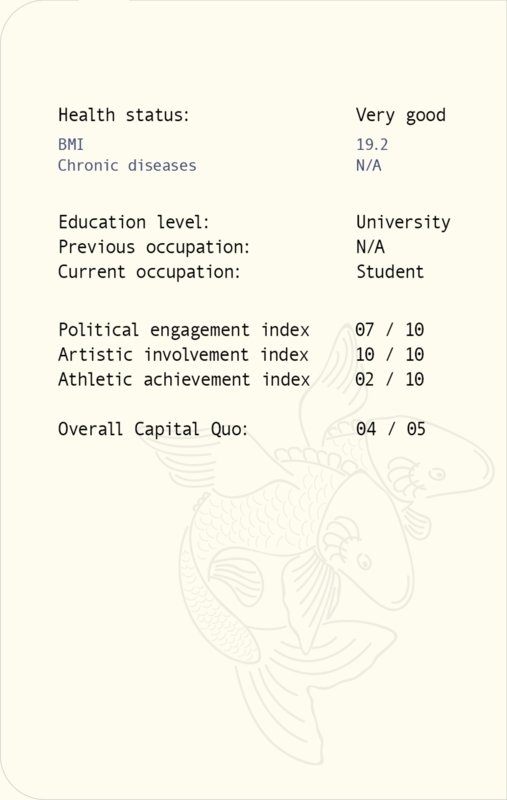 Every time one moves, an overall “Capital Quo” is generated based on one’s health status, education level and political/artistic/athletic engagement. This Capital Quo will then determine the available city zones that one is allowed to move to for the next period. This is a system to ensure there is not a huge imbalance in resource and talent distribution within the nation. 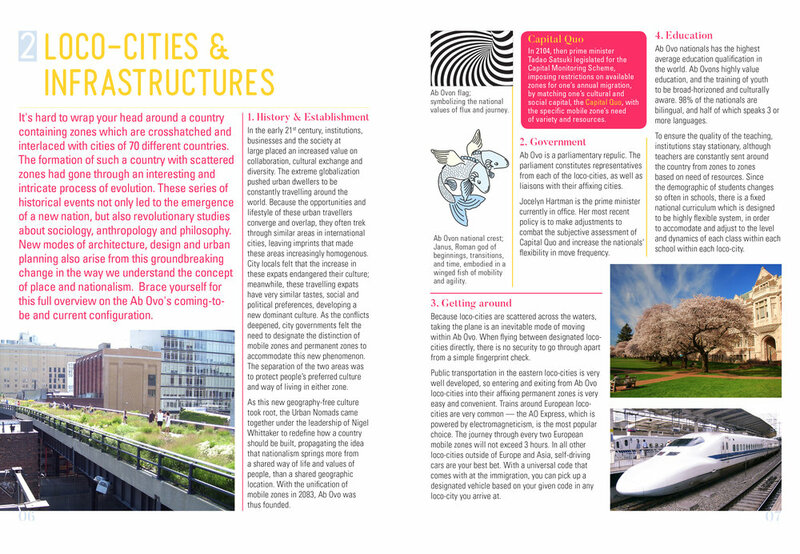 I wrote and designed a travel guide introducing the country Ab Ovo and its make-up of many mobile zones (called loco-cities) to visiting tourists, the Permanees, who live in permanent zones.